Argonite is a composite gas that consists of 50% Nitrogen and 50% Argon. The gas is mixed and stored under pressure. The composite is completely inactive and is not involved in the burning process. When any fire incident happens then the Fire/Smoke detectors will be activated. These detectors gives signal to the Fire Alarm Panel. The Fire Alarm Panel activates the Hooter and Stops the HVAC unit. Also the Fire Alarm Panel sends an Argonite Release command (CMD) to the Argonite System. Here in the animation we considered four Zones. Zone means areas or locations or rooms. Say if fire/smoke detectors are activated in Zone 4 then the Fire Panel sends Command 4. So Fire Alarm Panel can send Commands from CMD 1 to CMD 4 depending on the fire/smoke detectors activation in respective zone. 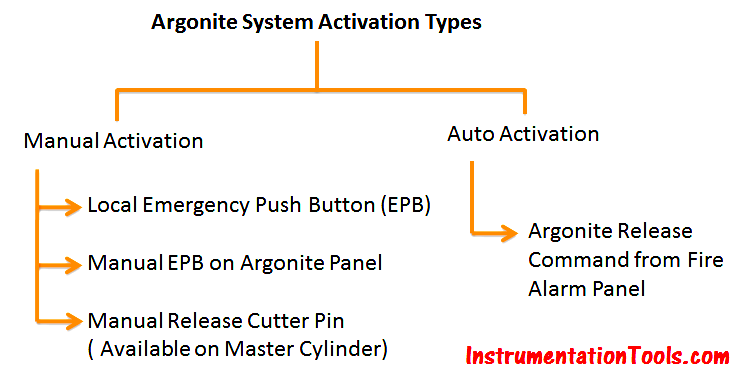 Now Argonite System receives the Argonite Release command from Fire Alarm Panel. Argonite system wait for some time to release the argonite cylinders. Typically the time will be from 30 seconds to 60 seconds. Say sometimes we often receives False Fire/Smoke detectors alarm, in that case we have to Inhibit the Argonite Release command. Inhibit means Stop the action. Inhibit Push buttons generally installed nearer to Argonite system or respective Zones. Inhibit Push buttons are provided on the Argonite Panel also as shown in animation. Say Inhibit not given and after the time time delay, Argonite system activates the Solenoid Valve on the Master cylinder. The Master cylinder gas will be released and it has two paths to go. one is main discharge line and second will go to next slave cylinder. The Master cylinder pressure activates the Slave cylinder. Now slave cylinder also released. Similarly the Slave cylinder may also have two paths to go. one is main discharge line and second will be go to next slave cylinder. (Here in animation only one slave cylinder operation shown). Like this concept, we can release many cylinders which are connected in series by activating one master cylinder. Also as we discussed, we have Four zones or Fours areas. so we have to release the gas to the fire effected zone only. so an ON/OFF valve will be provided in the Zone 1, Zone 2, Zone 3, Zone 4 Discharge pipe lines (not shown in animation). Whenever we receive the command from Fire Alarm Panel then immediately the respective zone ON/OFF valve will be Opened immediately. Remaining valves will be in closed state. Say Command 4 is received then Zone 4 valve will be activated. A Manual valve or Release cutter pin will be provided on all Master cylinders. In case of auto failure, we can use this manual valve to release the master cylinder. Once master cylinder releases, it activates remaining slave cylinders. Emergency push buttons are also installed nearer to Argonite system or Respective zones. we can activate the argonite system by using these push buttons also. Emergency Push buttons are provided on the Argonite Panel also as shown in animation. What is Manual Call Point (MCP) ? What is Gas Suppression Systems ? thanks for informations, it was important for future project.